rumoured to have slowed her. 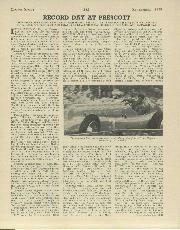 Denis Evans on the Bellevue Montlhery M.G. followed, making no mistakes and coming close to the banks. Time : 45.17 secs. The announcer had never noticed twin rear tyres on this car previously, but actually it has rather special rear wheels to accommodate them. Next up was G. H. Symonds (747 c.c. M.G.) who Made a poor start and suffered misfiring, though the car—ex-Tongue R-type-cut in. noisily at the finish—a case of bad luck. T. H. Dowler's 744 c.c. M.G. was slow, taking 53.21 secs. At this point a dog had to be chased from the fairway. Fry, in the fascinating Freikaiserwagen, made an excellent getaway, came into the " S" wide, slid out, and did 43.2 secs., a better run than his qualifying effort and a truly fine show. back viciously twice in quick succession at the "5," clocking 44.14 secs. 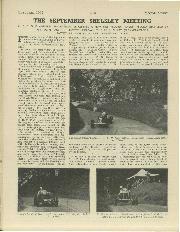 Clarke's sports Frazer-Nash was steady, in 48.82 secs., and Peter Clark's H.R.G., in its full Le Mans guise as bestowed by L'Ecurie de Lapin Blanc, swept cleanly through the bends after a neat start, to record 51.17 secs. Glegg, in black overalls, after trouble in commencing the machinery, brought the Alta-like Dorcas up in 52.7 secs., having momentary bothers just after starting and later doing furious tiller work. Roy Cutler's Frazer-Nash 'did 48.87 secs. in spite of slowing in the "S," and Dyke-Acland treated us to a fierce drive in his blown 1,408 c.c. M.G. illagnett, taking 40.13 secs. Instone had the revs, drop on the famous G.N. Martyr, blipping the " S," and hitting the bank, nevertheless doing the run in 47.01 secs. 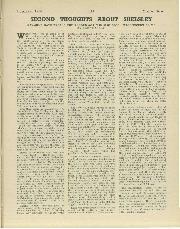 N. G. Wilson's 1,100 c.c. E.R.A. then started slowly and came up suffering bad misfiring, his time being 40.2 secs. to attend the sick spectator, no official medical man apparently being present. Again Moor essayed a climb with the "Wasp," but had engine trouble. Lord Howe brought a green works independently sprung li-litre E.R.A. 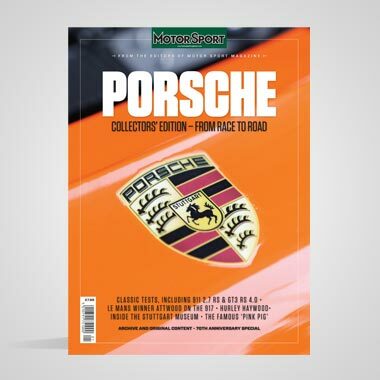 up in 42.16 secs., making one of the finest starts so far, braking heavily into the " S " and accelerating with smoking tyres, skilfully holding a tail slide. Up the final stretch the gear ratios seemed to suit the conditions exactly. It was a beautiful climb. 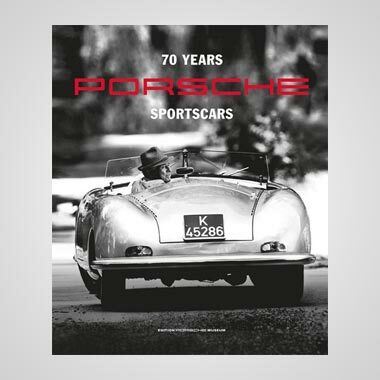 Arthur Dobson seemed to hesitate momentarily in Starting, with his white E.R.A., then came wide into the " S," swung to the road centre, glanced at his wheels, and was gone-a steady run in 43.4 secs. 47.47 secs. His number, curiously, was 47. 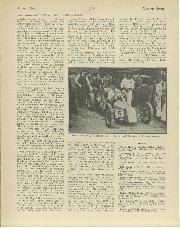 Came Percy Maclure, in the =blown six-carburetter Riley, now of 1,987 c.v., and after his run the knowledgeable among the spectators thought even more of the Maclure-Riley combination than they did after the I.T. Race, if that is possible. Usually Maclure corners very effortlessly, but now he really. worked, .closing in to the banks and getting the unblown Riley, by no means a sprint job, up in 43.37 secs. secs. Thereafter it broke a magneto platform and did not run again. radiator obscured Pane's view. He took 42.63 secs. Raymond Mays followed. 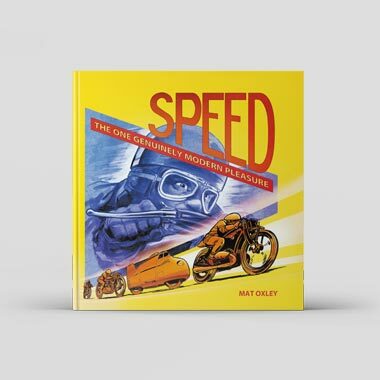 He hardly seemed to cut out for the Kennel Bend and accelerated hard out of the '' 5," sliding almost into the near-side bank and off up to the finish in a cloud of smoke. That slide apparently cost him the record, for he took 38.9 secs., fastest run of the day. Bert Hadley was naturally out for blood, but after a fine commencement the Austin got into a tail slide coming out of the " S." The tail hit the near-side bank, then the car hit again, sent up a fountain of mould and turf and landed about 35° across the road. Bert managed his car marvellously, keeping the revs, in hand and yet never easing up, and his time of 40.53 secs.-.44 of a second slower than before-was most creditable. Mrs. Petre (Austin) snaked to the finish in 46.08 sees., and Evans (M.G.) drove well to clock 45.06 secs. 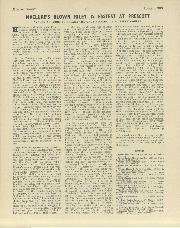 Symonds's M.G. stopped, Dowler (M.G.) did 51.21 secs., and Fry coped well with difficult situations to do 41.52 secs., cutting rather early for the " S." Hunter got some spin away and the Alta was a handttd out of the " S," to clock 44.5 secs. Clarke corrected a slide neatly and the sports-equipped Frazer-Nash did 49.05, Clarke's H.R.G. .seemed oVergeared and took 52.30 secs., Buckley's Austin popped back and slid near the finish (43.98 secs.) and Glegg, hunched over the wheel of Dorcas, had. 49.58 very full seconds. Cutler's aluminium Frazer-Nash did 48.01 on a steady run, Dyke-Acland's M.G. cornered fast to clock 46.04, and WindsorRichards's Vauxhall slid at the first bend of the " S " (48.94 sees.). Most drivers were pulling their times down. Hughes (Vauxhall) almost missed his final changeup after cornering wide and tail-wagging (52.2 secs.) and_ Maclure never allowed his Riley to go astray, doing a splendid 42.6 Secs., accompanied by an E.R.A.-like exhaust note. Instone did a well-judged 47.27 secs. with Martyr, and Wilson, his E.R.A. starting at the fourth pull, cornered steadily (48.07secs.). Cuddon-Fletcher's M.G. smote the bank at the same spot as Hadley, but went on fast (45.29 secs. ), and SuIman seemed to go fiat out round the "S," rear tyre flexing, to do 51.73 secs. The Carlmark-J.A.P. failed at the " S" with mechanical trouble, and Lones started slowly, the Tiger Cat bouncing and sliding at the " S " (46.84 secs,). Goodwin's Frazer-Nash had trouble and came to rest early and Vaughan fairly flung the B-ecke-Powerplus into the "
S" but was hampered by misfiring (45.03-secs.). Lord Howe did not :appear to get the E.R.A. off so well as on his previous run, but the acceleration was immense and he held a nasty slide out of the ".S " like the master we know him to be. Time :41.25 secs. 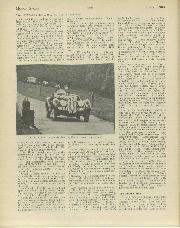 Moor's' •Wasp " now appeared, front tyre flexing under the stress of Shelsley cornering, but the car really stable in spite of G.N.-size covers. But misfiring did not help and the time came out at 46.54 secs. time . . . ? The Ladies' Record, too, is still Mrs. Petre's property, which she shares with Austin, in 43.7 sees. That, too, must one day fall . . . Fastest Climb of the Day (8helsley Challenge Trophy and £.100): Raymond Mays (1,750 c.c. E.R.A.). 38.90s. Runner-up (Midland A.C. Challenge Trophy and £50): H. L. Hadley (744 c.e. 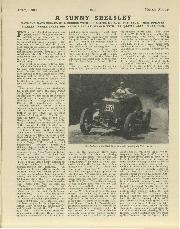 Austin), 40.09s..
Third Fastest : A. F. P. Fane (11-litre Frawn. Nash), 40.13s. Fourth Fastest : Lord Howe (11-litre E. It 41.25s. Fifth Fastest : J. G. Fry (1,097 e.e. Freikalserwagen ), 41.52s. Fastest Sports-Car (Midland A.('. Sports Trophy and £20) : A. F. P. Pane (2-litre Fraser-NashB.M.W.). 47.01s. Second Fastest Sports-Car (Midland A.('. 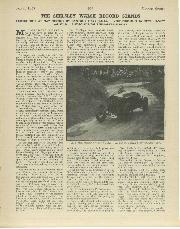 Trophy and £10) : John Clark (11-litre Frazer-Nash)„ 48.82s. Trophy and .Mrs. Kay Petre(747 e.e. Austin), 441. ( Ks. Forrest Lycett Trophy (Fastest pre-1914 racing. car): A. S. Heal (1010 10-11tre Mat). 47.90S.